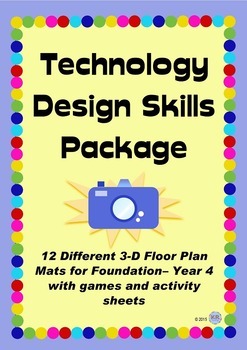 This package has many activities to develop the Australian Curriculum’s ‘Design and Technologies Processes and Production Skills’ and ‘Geographical Inquiry and Skills’ outcomes for Foundation to Year 4 students. The aim of these activities encourage development in students ability to view objects from different points of view (top-down /bird’s eye view, side view, front view). Students get to physically manipulate doll’s house furniture in a 3-dimensional room and then move, turn and photograph it from different viewpoints. 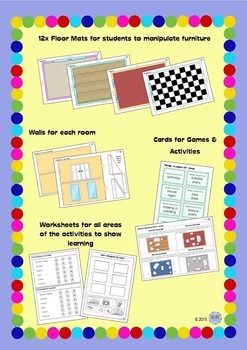 Students can practise skills for designing layouts for particular events/situations and drawing objects in a blank or grid layout. Students are encouraged to self-evaluate their design, describe using mathematical positional language the locations of objects in their rooms, and describe the process they used in making their design. There are games/activities for students to learn about different types of designers and the products they design. 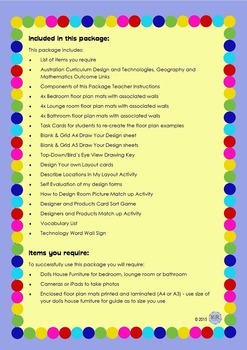 Bedroom Design Project Unit of Work Years 3-7.